Home » VectorVest » Buy Staffline #STAF says VectorVest. Strong track record, plus the stock continues to offer plenty of capital and dividend growth potential. 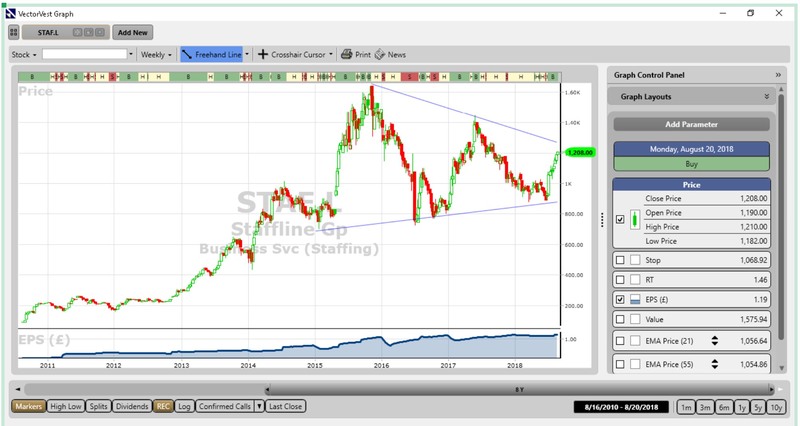 Buy Staffline #STAF says VectorVest. Strong track record, plus the stock continues to offer plenty of capital and dividend growth potential. By Harry Dacres-Dixon in VectorVest on 22nd August 2018 . Established in 1986, Staffline (STAF.L) is now the UK’s market leading Recruitment and Training group. It has two divisions namely Recruitment and PeoplePlus. Staffline Recruitment is the UK’s leading provider of flexible blue-collar workers, supplying over 60,000 staff per day to c. 1,500 private sector clients, across a wide range of industries including agriculture, drinks, driving, food processing, logistics and manufacturing. It operates from over 400 locations in UK, Eire and Poland. The PeoplePlus Division is the leading adult skills and training provider in the UK, delivering apprenticeships, adult education, prison education and skills-based employability programmes across the country. STAF first came to the attention of VectorVest as the key RT (Relative Timing) metric ticked up over 1 in early April 2018. A sharp drop to year lows of 880p in June flagged further alerts, since which time both the share price, and RT numbers have moved sharply higher. Today, the STAF RT metric, (a fast, smart indicator of a stock price trend) logs the stock at 1.46 – excellent on a scale of 0.00 to 2.00. The RV metric, (an indicator of long-term price appreciation potential) logs STAF as good value at 1.39 (on a scale of 0.00 to 2.00), and the stock also registers an excellent GRT (Earnings Growth Rate) rating of 21%. Despite trading at 1,208p, VectorVest still sees further upside for STAF shares through to a current valuation of 1,575p. 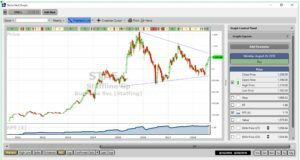 To highlight the long-term performance of STAF.L the price action over the last 8 years is shown above with earnings per share (EPS) shown in the window below the price. The share has been trading within a consolidation pattern since 2016 and is presently nearing a breakout of that pattern. The 8-year weekly chart above presents a very bullish situation if such a breakout should occur with a technical target of over 20 pounds over the next few years. The technical target is based on the size of the trending move from 2011 to 2016. The share is on a Buy recommendation on VectorVest after charting a double bottom pattern at support during 2018. Summary: During the thirty-two years it has been in existence, Staffline has delivered impressive and consistent growth as a company. Indeed, sales revenues for the past ten years have increased at a compound annual growth rate of 25%, so the company’s target to grow underlying EPS to 200p in five years is a claim to be taken seriously. With this in mind, the sharp drop in the shares in June prior to the interim results provided an excellent opportunity to pick up the stock at a discount. Notwithstanding the sharp recovery since then, VectorVest remains of the opinion that STAF continues to offer investors plenty of capital and dividend growth potential with a decent margin of safety. Buy.